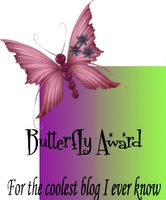 Thanks to Kris Waldherr for passing on this award to me, and I'm very happy to pass it on some deserving blogs. What a great way to network with other bloggers. Thank you, Elizabeth! I am truly honored by his acknowledgment. Thank you Elizabeth. I'm flattered, truly I am. Thanks so much Elizabeth. What a gem you are!